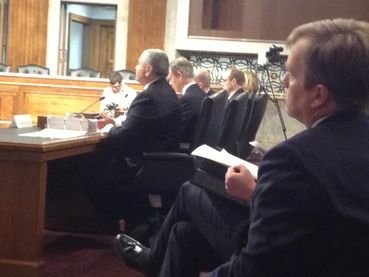 Below is a photograph of the senior JPMorgan witnesses testifying before the Senate Permanent Subcommittee On Investigations on Friday, March 15. They oversaw the loss of more than $6 billion in depositor funds. This loss dramatized many issues, including the need to return banks to safe lending to the real economy as opposed to risky speculation on meaningless gambles. The loss also showed that some banks are too big to manage, as JPMorgan was considered well managed before this major loss. And the loss also showed that the bank is too big and complex to oversee. These witnesses answered questions for about three hours from Sen. Carl Levin, (D-Mich), who chairs the subcommittee; Sen. John McCain (R-Az), the ranking Republican, and Sen. Ron Johnson (R-Wisc), among others. In the foreground is Peter Weiland, former JPMorgan risk manager. In the far back is Ina Drew, former chief investment officer. And here are the three dozen attorneys helping them testify. Most are paid well. Many worked for the government, a few as recently as a few months ago. After the JP Morgan executives testified, the subcommittee heard from the government officials from the Office of the Comptroller of the Currency responsible for overseeing JP Morgan and several thousand other national banks. Bartlett Naylor is the financial policy reform advocate for Public Citizen�s Congress Watch division. Message to the corporate behemoths such as JP Morgan: Are you still employing mathematicians and physicists with Ph.D's to sort out your derivatives. No wonder you lose such vast sums, when the people themselves have zero experience of banking in the real world. If they are "too big to fail" too big to jail, they continue these hi-jinx, as if they were schools boys playing with Daddy's car. Than maybe, it's time to just nationalize the banks, break them up and sell them to highest bidder. We could do with more smaller banks. You cannot currently send a star to Darren because you have done so within the last day. You are welcome Angelika. Smaller banks around the world perhaps?You cannot currently send a star to Angelika because you have done so within the last day. �Dwight Eisenhower, Republican, U.S. Pres. Thank you Elle for the most appropriate quotes! You cannot currently send a star to Elle because you have done so within the last day.